Due to increased energy demand in southern Arizona, the Department of Energy requested that Tetra Tech prepare an Environmental Impact Statement (EIS) for the proposed alternatives to constructing a 175 mile transmission line. 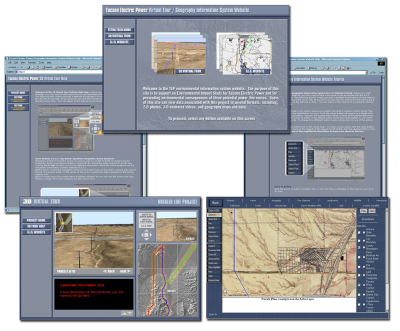 To support the EIS and better communicate environmental consequences of potential power line routes, Tetra Tech created a multimedia web-based interface for 2-D, 3-D, and animated GIS maps and data. The final product is a component of the website that accompanies the EIS. The purpose of this GIS and 3-dimensional tour website is to provide an engaging and accurate explanation of the environmental consequences of the project’s alternatives for constructing a powerline to the public and decision-makers. Two-dimensional GIS-based maps, data and aerial photography can be viewed through a user-friendly, intuitive interface to allow illustration of various resources (threatened & endangered species, vegetation, population, land use, viewsheds, etc.). To improve visualization of the power line alternatives, 3-D animated "fly-throughs" of the landscape elements were prepared. These fly-throughs use GIS data, photography, videography, and computer animation to illustrate current site characteristics and simulate future conditions.